I will be using two 2200mAh 2s RC hobby grade batteries .. I also had to make a harness to be able to use XT60 connectors and keep the Zanflare B3 stock . 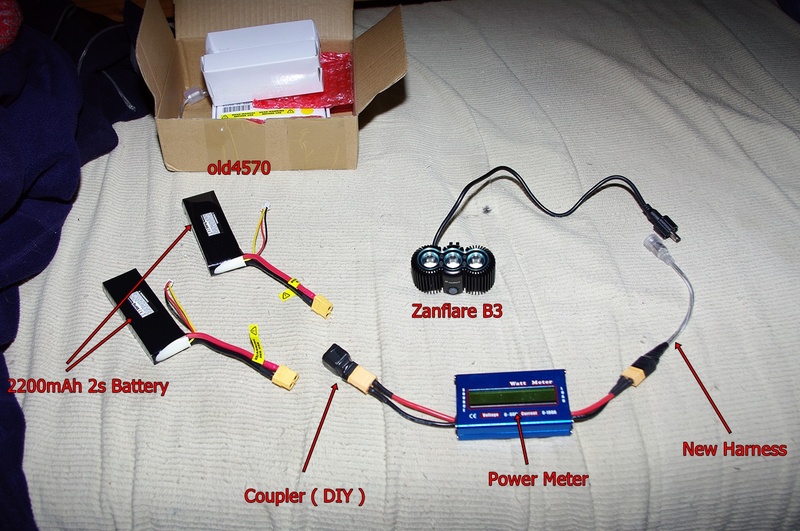 To check current draw I will be using a RC hobby current / power meter . I will also be doing some video . 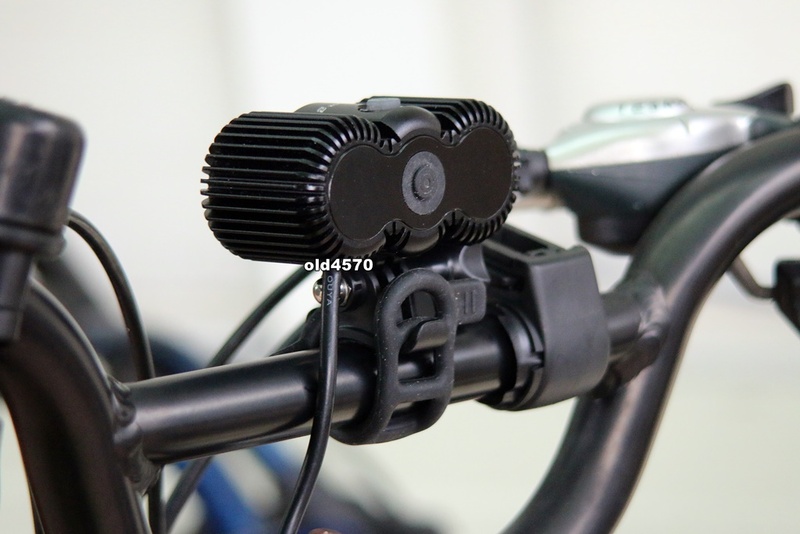 The B3 can be put on a headband ( headlight – damned powerful headlamp ) , mounted on your helmet or to your bikes handlebars . Due to the design of the mount , if you have some action cam mounts around then you could utilize those as well . I only got the B3 a few hours ago , spent that time making stuff so I can test it .. ( Charging batteries right now ) … But from my limited time with the B3 it looks to be a serious quality product . Low – Medium – High , One emitter , two emitters or three .. Thats 9 ways to run the B3 ( might even be a disco mode in there ) .. Or was that the low battery warning ? ( Batteries were not charged ) . https://www.indiegogo.com/projects/b3-bike-light-your-night-owl-bicycle#/ = Crowd funding the B3 project > If anyone is interested ! Anyhow , will be working on getting the review out there and hopefully some decent video ( hopefully ) , need to test more cameras .. Thanks for the tease of a review old4570. I dont know if you wanted the light or if gearbest just sent it to you. But, Im seeing an awful lot of “zanflare” threads and well so far they seem more heat than light. Please finish your thread because a number of members had questions. if you could look over huntkings review thread and answer some of the questions I am sure the interested member would be grateful. second bite at the apple for this light. and Gearbest has responded to my request with a pretty good BLF group price (or maybe it is a company sale?) but they responded quickly professionally and responsively so good job Gearest. I was just outside trying to shoot some video ..
Its been a wet and wild week , and as I was outside with my 2nd cam it was beginning to rain . So a video shortly . AS for the B3 , as best I understand .. These are new , very new . And this sample may be possibly from the first batch to be made … So one must tread lightly ! On high 3 emitters , the back yard is lit up like it was day time ..
A few more video’s to do ! But static testing has been completed , next the light goes on a bike .. The B3 stopped working !!!! I am sure everyone will get a kick out of this .. I was just about to do some more tests when the B3 refused to turn on , ?????????? Did the B3 just DIE ! on me … %^*&$@&*& Not one to give up , I connected a single battery to the harness and Viola – There was life … Obviously there was issue with the coupler .. I connected one battery to it and then to the harness and the B3 worked . I connected the second battery and nothing ! So there you go … I am just about to go and re-solder the coupler ! So just a little snippet ! 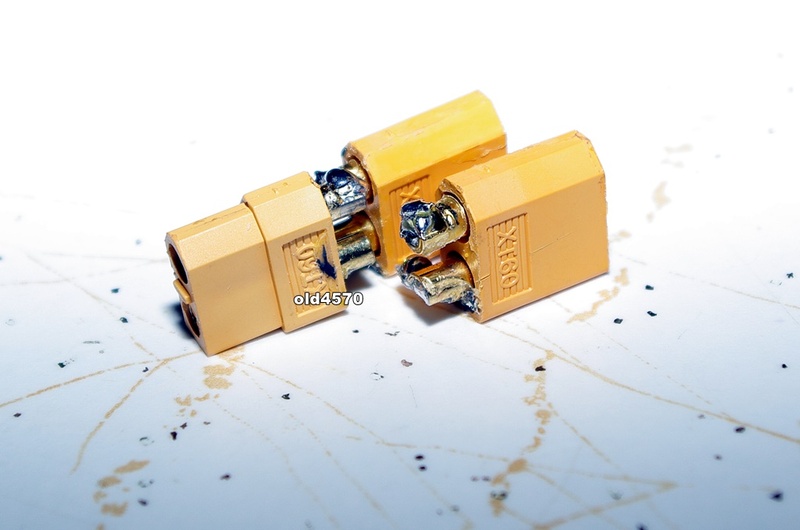 PS – the solder joints for one of the XT60 connectors had broken ..
Got to start on the next video ASAP ! B3 is ready to go on a bike ride ! Just hope the weather holds , but looks like rain ! https://www.google.com.au/search?q=melbourne+weather&oq=melbourne+weathe... = Not looking good ! Its bucketing down in Noble Park. Have you a rain coat? Yeah – it started about 10 minutes ago , really came down hard ! I will most likely go for a night time ride tomorrow night . The camera I want to use is not water proof – neither am I … ( the action cams have poor night time performance – so I will try a DASH camera ) Just about to start editing ( checking ) some video I just took . So here is a video , probably the last I will share till the review is posted . I really like the design of this light. But for that price I’d expect a waterproof 18650 holder and wiring of good quality to actually be able to use it out of the box. I probably am so used to bike lights in all shapes and sizes being from The Netherlands that trends like having a good universal cell holder to connect bike lights like this has been missed by me. It all fits rock solid, the lights can be removed easy and be used as normal lights. Nice waterproof and no wires. So what would be the advantage of this Zanflare? Honestly , that would be for you to decide ! So for the review I will try and be as factual as possible , provide as much information as possible , so that readers can hopefully form their own opinion based on facts rather than conjecture . As I understand it , there should be some reviews posted on Bike forums . There is one already up and running that I have been made aware off . As one of the first to get a hands on to the B3 can you say anything regarding the build quality? How is the fit, finish. Overall workmanship. Do you think it is water resistant? I don’t ride in the rain often,, but at times I end up splashing through creeks and puddles on my mountain bike. I would use this light for single track mountain biking, this is the start of the night riding season (.eastern US). The beam appears to be a single circular hotspot with a wide bright corona, is that how you would describe it? I would like to see more beam shots, it you can. From what I can tell the beam may not meet certain regulations in certain countries for use on road bicycles. The beam could blind on coming automobile drivers. Glad to see you’re working up a review as well old4570. I’m slowly gathering data and posting my review in stages (link provided in post #13 above). So far so good with the exception that there is no “programming mode”. We thought there was, but it turns out it’s just a 4th mode referred to as “Personalized Brightness Setting” (really serves no purpose). Build quality looks/feels really good, but I’ve not cracked mine open yet. I took sphere measurements last night, but haven’t calc’d up the numbers yet (they’ll be posted in my MTBR thread if anyone ones to check later – I wasn’t planning to post a review on BLF). 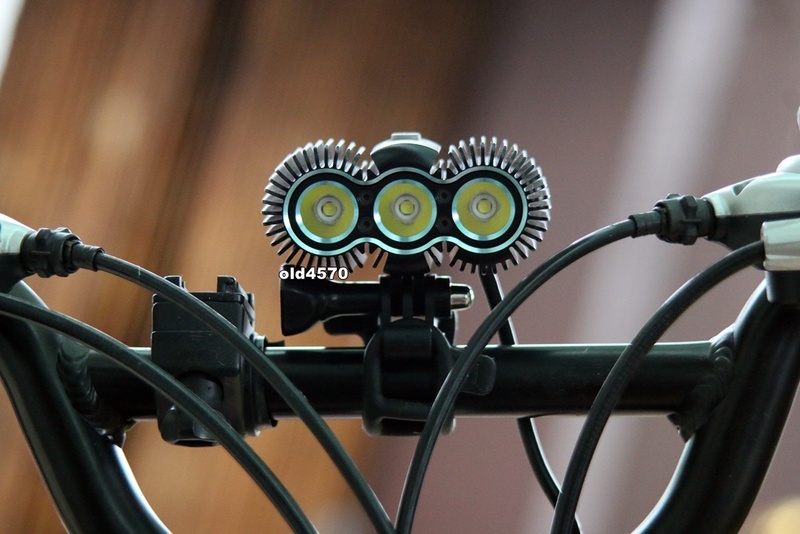 Remember people, there is still distaste in some of our mouths over this light since it’s connected to the “MTBR custom build” project that GearBest abandoned us on last December. I think EVERYONE needs to be aware that this is where this light started BUT they took the initial work, dropped us, and ran with it themselves. For me rain and reviews = good. Its raining in almost all my first videos. I have to fix my bike i was running road tires at 100psi on my mountain bike and hit a gutter to hard and broke some spokes (being a fatty does not help). I have 2 road bikes but they are a pain to ride you hit a twig and get a flat. This is mainly for avid mountain bikers riding singletrack in very dark conditions needing as much light as possible (flood & throw) and more runtime than a single-cell flashlight provides (I know, yes you can swap in cells, but your running down out of regulation pretty quick too). I’ve tried just a flashlight (Convoy M1), but it was nowhere near enough light to be comfortable with on fast singletrack. You’ve got roots and rocks and critters to watch out for and they come up quick. I did a bikepacking trip on rail-trail a few years back (it’s posted in a thread on BLF) and I made due in pitch black conditions with a 150 lumen 3AAA light – that was rail-trail conditions which are much different. old4570 – do me a favor and post a link to your actual review thread in this thread when it’s ready so I see it via “new post notification” for this thread. I’ve been out of the loop here a bit but if this is the case, WTF are they doing wanting crowd funding for it? Always interested to hear of a decent bike light but this sounds like a very dodgy way to do business. My review will be posted in about 2 days … I will try and get as much video as possible ( on the road ) It does strobe , so I don’t see why you could not run it on the road .. The light is more flood than throw .. + Plenty of cars out there running their lights too high blinding people .. Just angle it down ! The video of the light against the wall is (?) a little misleading as the camera shows what the eye does not see .. The camera highlights the bright and diminishes the dark effectively lying to the viewer . ( Its mostly flood ) There are some really good things about the B3 , and some things I would have done differently … Again I will try and make the review as detailed as possible . 80% chance of rain here tomorrow old4570 but Friday looks a bit better. Ride safe, looking forward to your review. Care to give an opinion on whether a different lens might be fitted to solve the “blinding people” issue and spread the beam sideways a bit? how many actual cyclists are even on the budgetlightforum? now how many regular night riders? You doesn’t need to be a member to read posts here, right? So it is not that important how many cyclist are members, but how many people can came across it. Of course it is up to Zanflare to decide how to do business. Not saying I agree with all, but here we are. its not a thrower – the camera lies .. The B3 is mostly flood .. 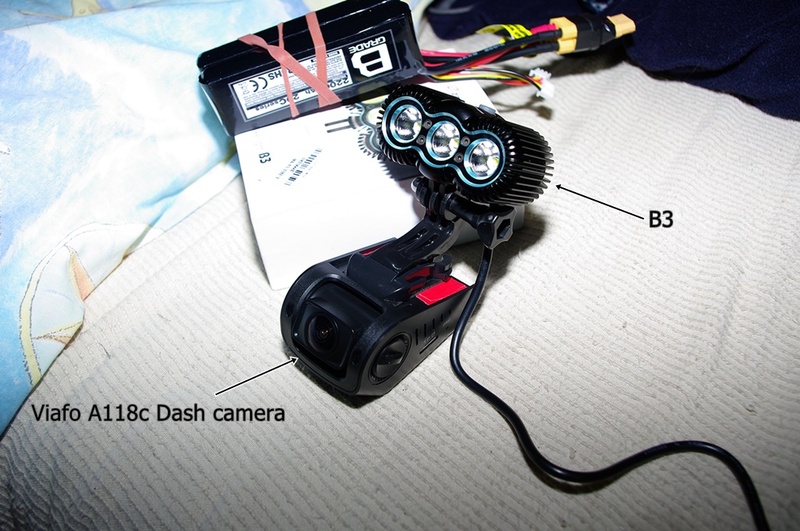 The action cam highlights the brightest part and diminishes the rest making the B3 look like a thrower … You should see how the F1 looks ( like a search light ) .. Thats why I will be using a Car Dash Camera on the bike .. So tomorrow I will be mounting the B3 , a dash cam , and a action cam to the bike helmet . + More video .. All day I have been thinking of things to check on , make sure I have not left anything out , just 5 minutes ago I remembered something I had to check … I was going to do it earlier but the XT60 solder problem put a halt to it ( Had to fix the XT60 coupler ) As for blinding people , just point the light down . 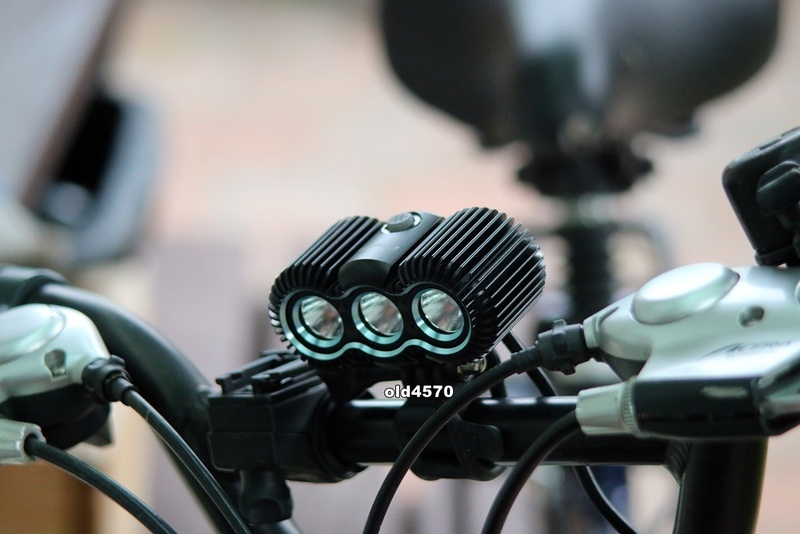 I see bikes out there and their blinky modes are plenty bright , I dont think the B3 is any worse . Sounds like you will get some information soon! Thanks for your work. This light for some reason has really got my interest. The guys at MTBR are really doing great as well. Its new , it’s here , it’s controversial ..
And it is a light , ok not a flashlight ! But certainly interesting . It’s 11.51 PM .. This is my last post for the 23 – August … Goodnight everyone ! it;s hard to seal around the cable, too, look for that! If you know your going to get it wet – prep it for such . I dont know of any diver that does not PREP his diving torch . Tear down pictures posted on MTBR forum …. Houston – We have a problem ! I really wanted footage from a dash camera and action cam , so here is my solution . I am really disappointed ..
A friend of mine has a bike , and he lives near a park , so I may be able to get that bike footage – but it wont happen tonight ( it could – maybe ) I will call him and see .. The best laid plans of mice and men !